Do you have any road trips planned before school starts? I don’t know about you, but I love a good car ride. David and I drove to a friend’s wedding two weeks ago and then I road tripped to a bridal shower with my mom and sister last weekend. Summer road trips are so much fun, but it’s definitely worth the effort to do a bit of preparation before you hit the road. 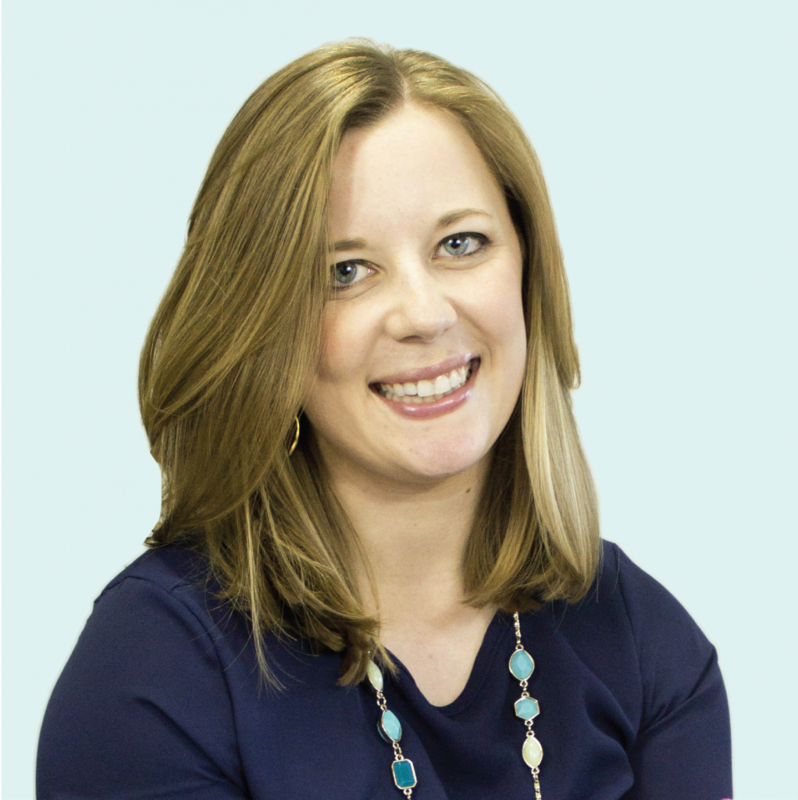 As I was prepping for my recent road trips, I thought it might be helpful to share some tips with you for organizing your car for your upcoming travels. 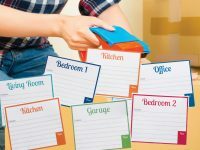 As a bonus, I’ve created a printable checklist so you can easily prepare for your next trip! 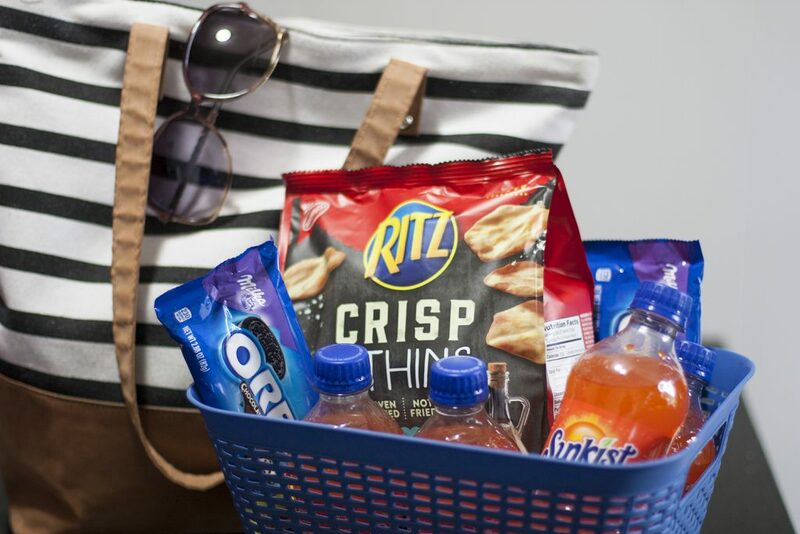 Pssst….click here to enter the #RoadTripTreats sweepstakes. 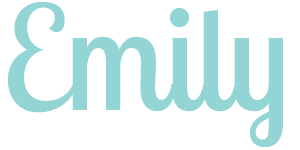 You could win over $3,400 in prizes! 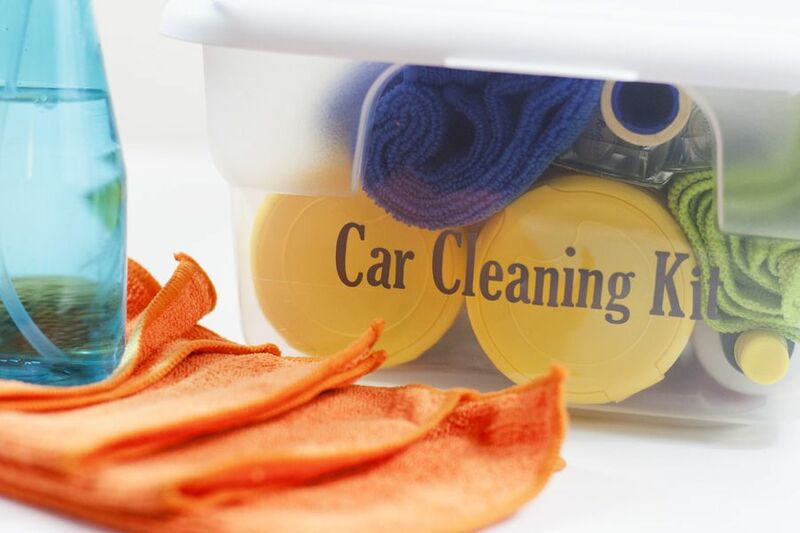 The very first task in preparing for a road trip is to clean out your car! First, clear out all the clutter and extra stuff. Then vacuum the upholstery, dust the interior and drive through the car wash. If you’re due for an oil change or other car maintenance, take care of those things before you hit the road. Don’t risk being unprepared should you experience car troubles. Tuck a roadside emergency kit in your trunk so you don’t get caught without jumper cables or a flashlight. Don’t forget to print out or load your phone with all of the itineraries, directions and other travel documents that you will need for your trip. 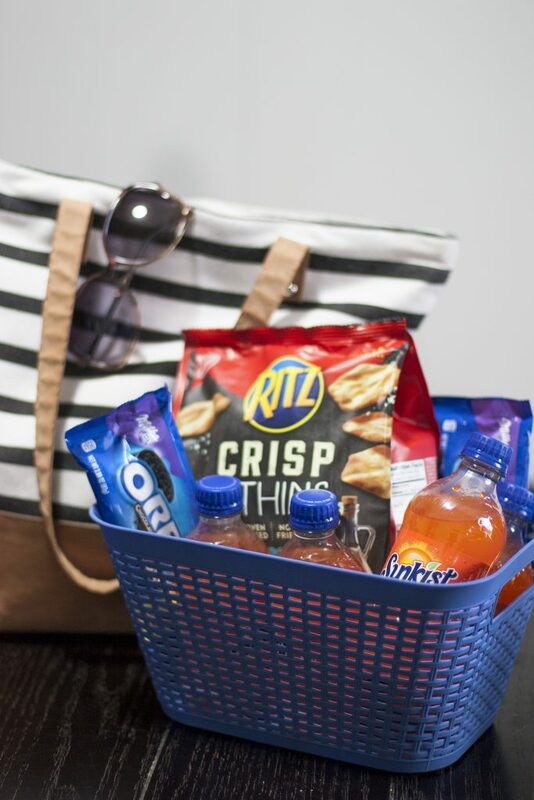 Road trips are always better with snacks! I prefer to swing by WalMart to stock up on snacks before a trip so I can avoid high gas station prices. I like to choose something savory, something sweet and something to drink. 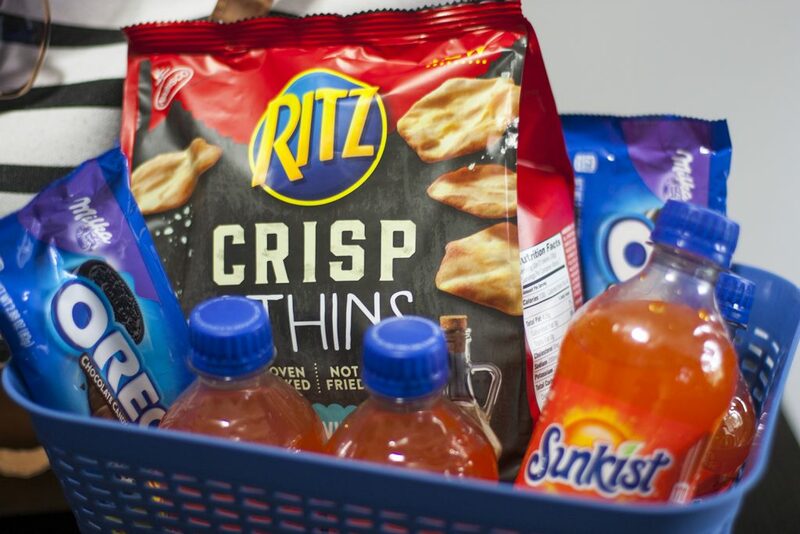 Pack a cooler with drinks and a bag with snacks. 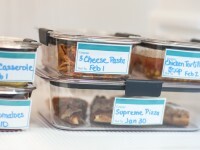 If you’re going to be driving for multiple days, divide snacks into separate bags for each day. That way you can ration snacks by keeping most of them in the trunk. For our road trip, I headed to the chips and cracker aisle and picked up a bag of the RITZ Crisp&Thins in the salt and vinegar flavor in the chips and cracker aisle. I loved munching on those thin and crispy chips during the drive! I also bought a pack of Sunkist® Soda in the convenient 12-ounce size. I spotted the new Milka OREO King Size candy bars in the checkout aisle and am so glad I tried them! Just imagine delicious OREO cookie pieces mixed in rich vanilla creme and coated in European Milka chocolate candy. Yum! Every road trip is better with an upbeat playlist! Long drives are also perfect for listening to your favorite podcasts or a good audiobook. 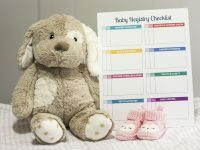 Keep the kids entertained by packing a bag of things that will keep them occupied and entertained while you’re on the road. Also, think about entertainment for the adults in the car. Your phone battery is bound to get low on a long drive when you’re using a lot of data and power. 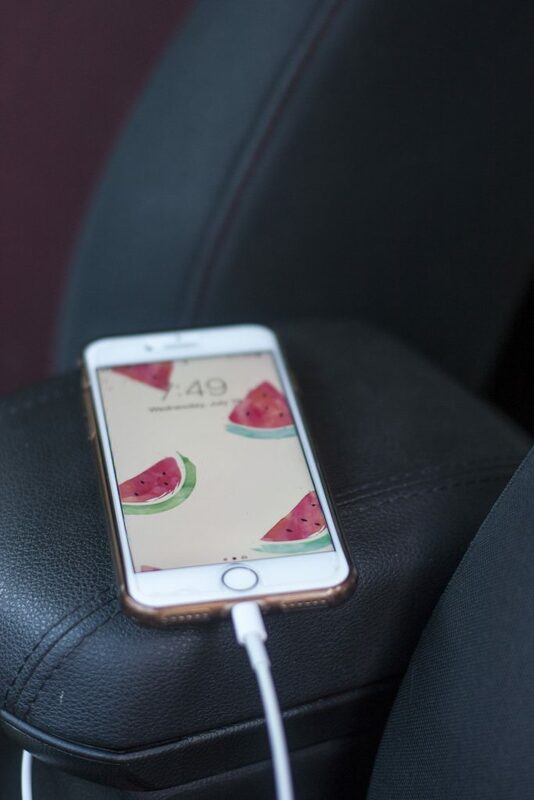 Plug phone chargers into your car’s USB or power ports or bring a portable charger. Always be prepared for spills and sniffles! Stock the glove compartment or your bag with wipes and napkins to clean up messes during your trip. Plan ahead for trash by outfitting each row of your vehicle with a trash bag or trash container of some sort. That will make it easy to contain garbage on the road and to empty it during pit stops. I like to keep plastic grocery bags under the passenger seat so they’re easy to reach. It’s always nice to have blankets and pillows along for naps in the car or if passengers get too cold. Pack them in the backseat so they are within reach during the drive. Keep all of your luggage in the trunk so it’s out of your way during your trip. There’s nothing more annoying than hitting the open road only to realize you forgot your sunglasses at home. Don’t forget to pack them! 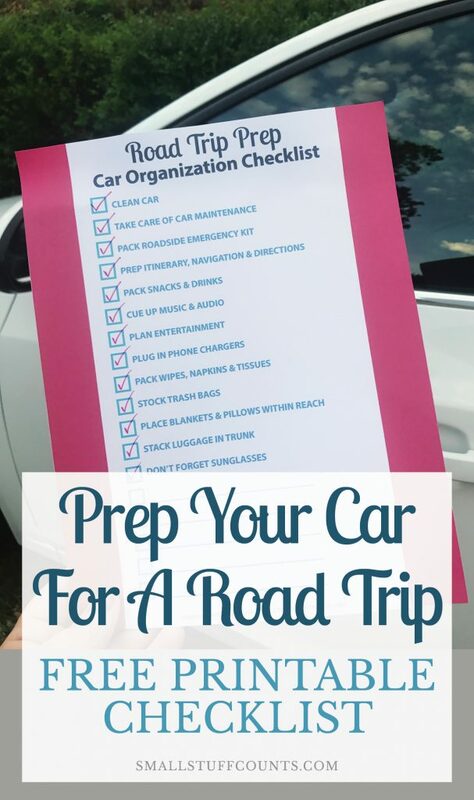 I put together this printable checklist for organizing your car for road-tripping. 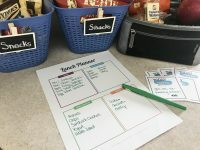 I hope it helps you as you’re preparing for your upcoming trips! I included all of my suggestions and also left extra space to add anything else you need to do before you head out on the road. 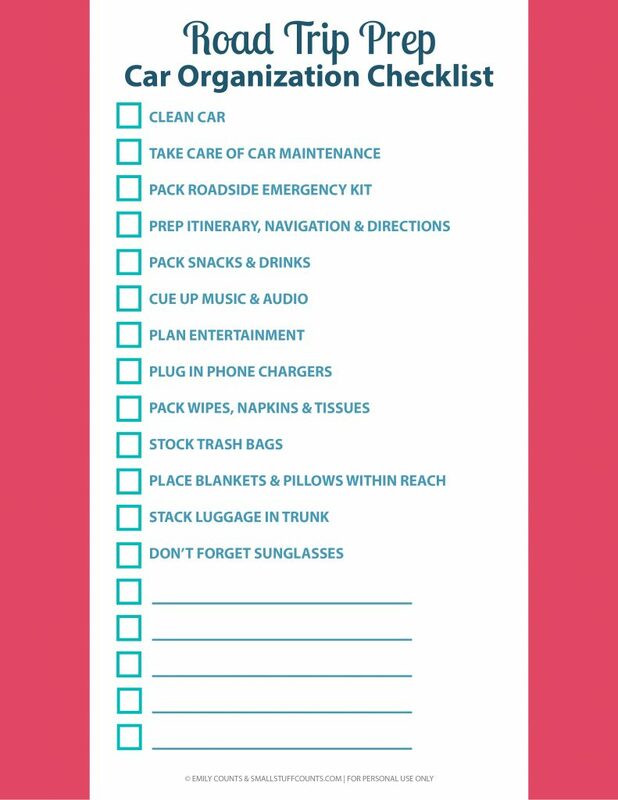 Print a copy of this checklist when organizing your car for your next road trip. What are your must-have road trip essentials? Happy travels! 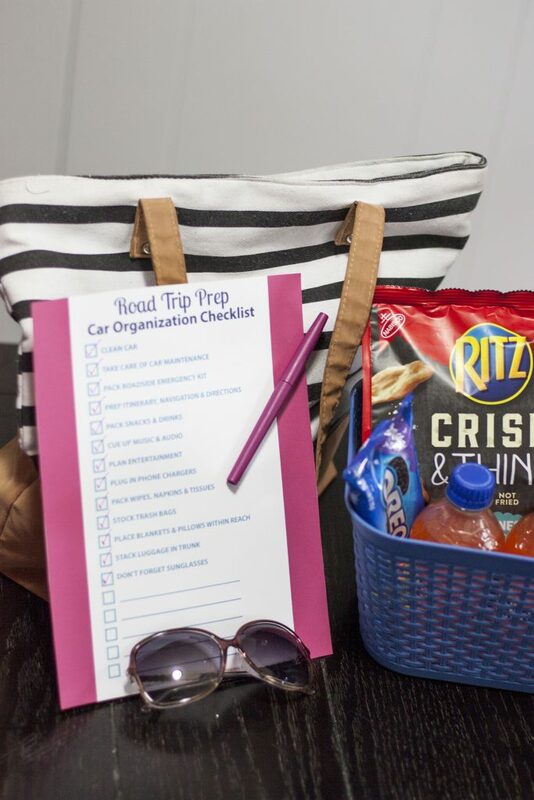 Don’t forget to click here to enter the #RoadTripTreats sweepstakes! You’re so welcome, Carrie! Glad you enjoyed the post!